A little less than a year also, Ellen DeGeneres’s gorgeous wife, Portia de Rossi kicked up plastic surgery rumors after fans and experts noticed her new face on her popular sitcom Arrested Development. As the debate got hot, the actress herself came out to clarify things and said that she is not trying to chase her youth. Is that so, we doubt? The latest news in is that Ellen has been forcing Portia to keep up with her plastic surgery. Apparently, the popular comedian likes younger woman and 41 years old Portia is trying hard to keep up with her youthful appearance. Portia is clearly afraid that Ellen may leave her for another woman, especially since the tabloids have been reporting disturbances in their marriage. 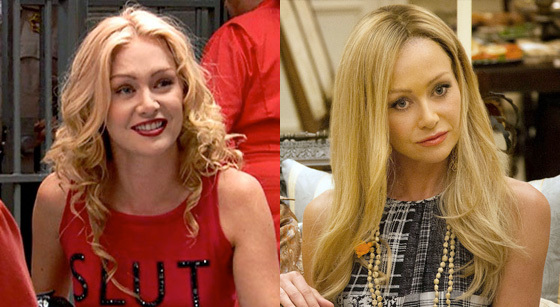 Has Portia De Rossi had plastic surgery ? Whether the rocky married life stories are true or not – we are not too concerned. But the plastic surgery seems to be real, especially after looking at her before and after photos. Someone’s got a sharper nose – great work by your plastic surgeon Mrs. DeGeneres. Experts opine that she might have also gone under the knife for a facelift – a little nip and tuck won’t hurt when it means getting back your 20s look. “It appears that Portia underwent nasal tip reconstruction. Her nose used to point downward, and you can clearly see it is now upturned. She also may have had blepharoplasty (eyelid surgery) to make her eyes appear wider. Lastly, she definitely appears to have Botox injections (judging by her perfectly smooth forehead) and filler injections to the border of her upper lip.” – Says Dr. Edward P. Mirinda to Hollywoodlife.com. Other plastic surgeons have come up with similar observations. How can we not agree, now?